You have arrived at GOLF-COURSES OF THE ALGARVE. Please click here.To return to the Home page main menu. (1)Vila do Bispo golf course.Parque da Floresta Western.18 hole golf course with a par of 72.Course 5524 yards. The first hole, 525 linear meters,can be a problem as it faces towards the sunrise and is a serious challenge for those hoping to reach the green in two shots. The fifth is Par 3 and 108 metres; but here the ball really needs to be landed on the green to hold par. Th ninth hole has the third shot being played over a river to the green. Hole number 11 has its green protected by water. Hole number 18, ends in a sort amphitheatre under the clubhouse. The clubhouse design being typically Portuguese provides panoramic views over mountains and Atlantic ocean and at least eleven holes can be seen from inside. An absollutely fabulous course and in fact is one of the Algarves premier Championship GOLF-COURSES.Many famous players are members here.Situated to have panoramic views of the Bay of Lagos and of the Monchique Mountains which surround it.Should be the first on your list to visit. Boavista Golf is made up of two very different halves,there is the Resort Section the 1st, 2nd & 3rd and the 13th to the 18th. Then the Country Section comprises the 4th to the 12th holes. Between them one gets a variety of attractive,challenging holes. The par 3 holes are known to be especially challenging and there is something very different on the 6th hole, golfers have to strike the ball over a splendid ravine.That will be well remembered,THAT WILL! Water features strongly on holes 13 to 17, which nowadays provides a safe haven for wildfowl and various other creatures and birds. The crystal clear Atlantic Ocean and fantastic scenery is visible from most holes,making this a delight amongst GOLF-COURSES for both golfers and casual visitors alike.. 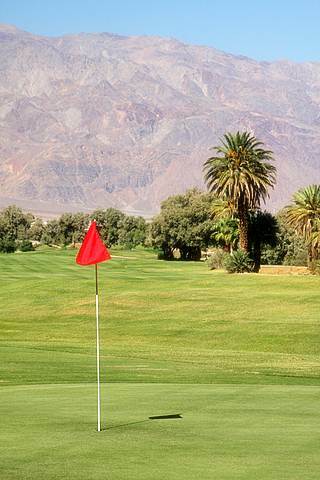 This is regarded as one of the most scenic GOLF-COURSES,anywhere.There is a real high point on the course where the views are simply outstanding.It is well known for its plantings of Almond trees which in February are a mass of white blossom.Indeed there is a tournament played at this time every year;so players and spectators can appreciate this wonderfull display. The fifth hole is noted to be the most interesting and most challenging.The tee starts off alonside the beach and the aproach is lined either side with sand.You apparently need to be on form to reach the green in three.The tenth green has a nicley positioned lake.Catching the eyes it seemingly entices golf balls towards its calm waters.The 4th,7th and tenth and sixteenth are noted for the stiff climb on the way to the greens but this does not seem to deter golfers. COURSE DETAILS: Palmares Golf Course was redesigned and reopened in October 2010. The very first golf resort in the Algarve, Le Méridien Penina Golf & Resort is the only resort in Portugal to have three golf courses within its 360 acres grounds. The Sir Henry Cotton Championship 18 hole course, and two 9 hole - The Academy Course and the Resort Course. Three times British Open champion, the late Sir Henry Cotton was invited to visit what was still a rice field to plan and set out a golf course. On an unpromising wet, treeless site,Sir Henry was keen to leave his mark on the Algarve. This turned out to be a complete masterpiece, becoming his epitaph. He created a course which has hosted ten Portuguese Open Championships.Plus The Daily Telegraph Seniors' Match play event 2000-1 as well as major International and Charity competitions such as the Sir Henry Cotton Team Trophy and Sir Henry Cooper & Mike Reid Charity Classic. Penina Golf Course is actually an hotel and resort too.This is a very fashionable golf course.What else would you expect being designed and associated with the all time legend Sir Henry Cotton! From the moment of arrival at Pestana course, you see a meticulous attention to detail, the green staff keep Pestana golf resort in perfect playing condition throughout the year, through training, equipment and experience. Years of experience in the field of golf course management means this course was designed to be enjoyed and played by people of all handicaps not just Professionals.All are welcome and treated the same here. The course, has the stunning Monchique mountains in the background, it runs through two valleys and offers winding fairways and challenging greens. On the first nine holes have views over Lagos Bay. The last nine wind inland, through mountain slopes.The sixteenth called "The Giant is one of, the longest in Europe: 604 metres Par 5. 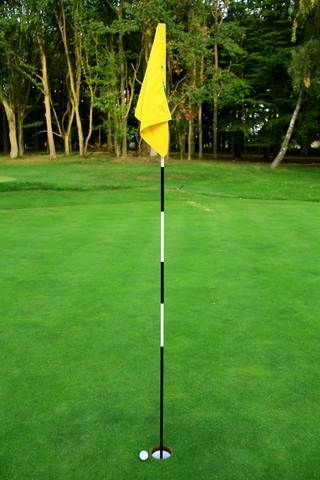 Manage a birdie here and receive a certificate and be on the club's roll of honour. Great trouble was taken on this the newest of GOLF-COURSES on the Algarve;to integrate this lovely 18-hole-course, harmonically into the natural landscape. It has five par 5 holes, nine par 4 holes and four par 3 holes. It is one of the longest on The Algarve.The greens are excellent but testing. The cluhouse has fantastic views over much of this course which due to being new is apparently still relatively quiet. Founded in 2003 by Architect Russell Talley (European Golf Design).TheProprietor is Imoreguengo, Desenvolvimento e Promoção Imobiliária, SA.The Director: Jorge Papa and the resident professional is John Seymour.Handicaps: maximum Men 28, Ladies 36.This course is a good choice for big hitters and the 14th is the signature hole.It has well placed deep bunkers and several water features and can be a real tester,which despite being so new feels quite a mature golf course.Testimony to the way it was integrated so carefully into the landscape.This is the way of the future for GOLF-COURSES design and rightly so! A quiet spot on the Morgado course.Great for one to sit and relax and study the form of other golfers!Or not! (7)Portimao.Morgado Alamos golf course.18 holes par 71.Course 6200 yards. 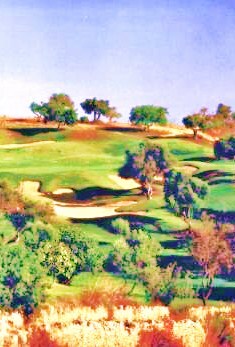 This is the sister course to the previous one.It is sligtly shorter and with fewer bunkers and more trees.It is said to be different enough to be a welcome addition to the GOLF-COURSES of the West Algarve. The Morgado Alamos Golf course is located to the north of Portimao, in Western Algarve and is near the sister golf course Morgado.The Alamos course is notable for its two large lakes which add greatly to the to the wonderfull views of the Monchique mountains.These views are complemented by a lovely vineyard adding to the sense of calm. When compared with the sister course Morgadosome find it more testing with it wide variety of holes and because of the narrower fairways.There seem to be more large native trees often marking out the smaller greens,which obviously will demand greater accuracy from the player. This beautifull course flaunts itself on a 980 hectare greenspot with many valleys and outstanding views of the mountains of mysterious Monchique.Adding to the picturesque scenery of this superb course are two large lakes.Lakes do add serenity unless you just lost your ball in one!Alamos is well known for plateau type greens needing great accuracy of putting.Some of them have several different levels to contend with;putting even more pressure on the individuals game. Silves.Pestana Silves GOLF-COURSES.18 holes par 70.Course 5615 yards. Visitors welcome to play a round every day. Players need to produce a certificate from their home club. 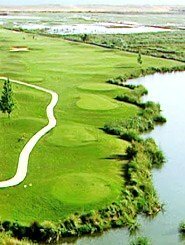 This course is spectacular in the setting of valleys around the Monchique hills.It starts off with a double water trap either side of the green.Let this be a warning to you.The course rewards attacking play with precision shots.So all needs to be well with your game if you are going to do well. 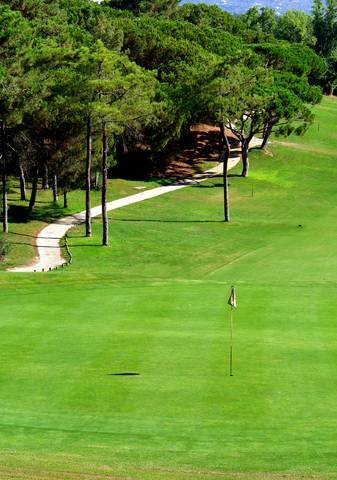 It seems visually well established in its grounds with large olive groves and huge pine trees.It is an exciting course not to be missed.GOLF-COURSES like this should be on every golfers list to play a round.There are 4 par 5 holes which are universally agreed to be exceptional and exceedingly testing. Silves.Oceanico Faldo golf course.18 holes par 72.Course 6604 linear meters. Designed by Sir Nick Faldo;this course was always going to be difficult and needing of a quick golfing brain.The man himself said,"The tees all give their own clues.Get it right and there is a reward". As he said it was an exciting project which allowed him to exercise his passion for design. The course is set on land at Amendoeira on a landscape which is both natural and Dramatic.The course flora and fauna is totally in keeping with the Algarve,with olive trees,wild herbs and cactus plants all in abundance.Incredible scenery and stunning views are everywhere and it is evident no effort was spared in using the wildness of the natural terrain.This is how GOLF-COURSES should be designed so as to have little or no impact on the area it encompasses. Sir Nick says he likes his courses to be challenging and it seems the general consensus is that this goal was well achieved. 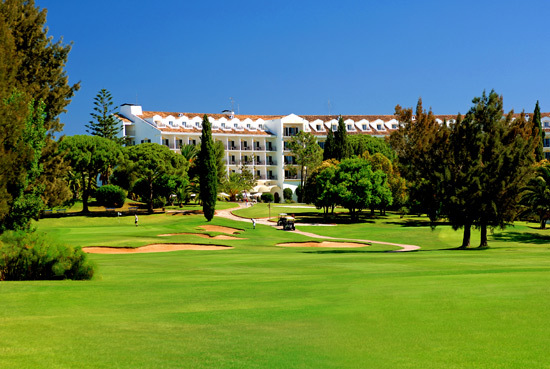 The complex at Vilamoura gives a total holiday package being a resort as well as golf. From the clubhouse fantastic views are on hand and food and drink as might be expected is of the highest standards. The pro shop is well stocked and all the normal services are available and this is recgonised as a Worldclass golf establishment. Sort of inviting isn't it.See how natural the course itself looks.The resort building looks kind'a right to! Silves.Oceanico O'Connor golf course.18 holes par 72.Course 6125 linear meters. Designed by Christy O’Connor Jnr.This course is really in direct competition with the Oceanico Faldo Course being almost on the next slope.Back to back if you like.This one is situated in a fertile valley.It has numerous water hazards, both lakes and watercourses situated all around the course.So the order of the day accuracy from all golfers.The grounds have been tastefully landscaped with large palm trees,giving a lush panorama to the whole site. As GOLF-COURSES go it provides a great challenge with its long fairways, t water hazards and wide greens.Great skill is also a prerequisite to read the subtelty of the slopes on the greens. Holes 7, 8 and 9, are par 4’s.They all present the golfer with picturesque lakes, so golfers’be very wary, accuracy is vital; or plenty of extra dry socks if you were practising with another type of shots last night. 3rd and 17th holes cagey par 3’s and the 14th and 15th have large ponderous greens which are in themselves rather a challenge. One 356m hole invites one to "have a go" but needs a precision drive,if not too much work is required on the two tier green.The 18th hole provides a fitting finale, to a great course with a river running on your right hand side. 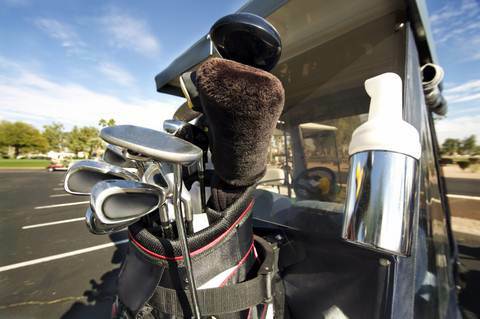 Golfers have been heard to call it a "humdinger". This magnificent of GOLF-COURSES brings a tumultuous end to our west Algarve round up.If we find any we have missed we will of course add them as soon as we find them and please if you think of a missed one please do contact us.We are always very pleased to hear from our readers. Carvoeiro.Pestana Pinta golf course.18 holes with 71 par.Course 5919 linear meters.Also 9 hole par 36 of 2980 meters. 8 times this most outstanding of GOLF-COURSES has hosted the European Seniors Tour Qualifying final.The Vale de Pinta course is well known and noted in golfing communities not just for its playability but also the clever and testing layout.It is well known for the beauty of its landscape and being a course of great enjoyment.It was opened in 1992 and designed by Ronald Frehas a very famous American golf course architect and Vale de Pinta has rightly gained its reputation as one of the best designed golf courses in Europe. You will find ornamental lakes amongst gentle rolling slopes and a wide range of trees such as Fig, Almond,Carob and Olive trees.There is one well known Olive tree,which is believed to be over 1200 years old! Whether or not this is the case it is certainly ancient and a remarkable specimen. The course has nine par 4 holes most going out with the tenth having the green on a distinct raised plateau.The 13th having an inviting lake.Five par 3 holes,one with a lake and a fountain.Holes 4,12,14 and 18 are par 5 most coming in.The 18 is an open your shoulders and "blast it" 581 linear meters. This is one of those GOLF-COURSES to put on your agenda.I think you will be glad you did! Carvoeiro.Vale De Milho GOLF-COURSES 9 hole par 27 course. Course Description.Situated close to the village of Carvoeiro this is different amongst GOLF-COURSES;being totally family oriented.It is only 926 meters long and is probably one of the best courses to learn the game on.This means the lovely course overlooking the Majestic Atlantic ocean has been cleverly designed.Difficult enough to teach the game to a high standard;it is also used by class players to improve their game.Plenty of twists and turns are there awaiting the unwary.Plenty of sand traps for you to learn how to get out of bunkers and lots of water to paddle in and retrieve your ball.No better incentive exists to determine one to learn to improve their swing. It was designed by Dave Thomas who I believe also designed The Belfry and many other courses.The course record is 48 by a Mr John Roles. This is the hole on the course that is apparently the most talked about.The 2 hole. This course really is one of the most beautifull and welcoming.As we said before they cater well for families. You might think being nine holes they might be a little lacking on facilities.You would be very wrong though.Course Facilities include a Driving Range, Putting Green , Chipping Green & Bunker practise.Plus a Golf Academy with a computer which through video analyzes you swing.Then there is a Snack Bar and even a snooker room .Though I reckon the course itself will be calling for most of your attention.Some of the scenery has been described as entrancing and just sit and admire.GOLF-COURSES like this one are a rare treat to find for all. Salgados was built in 1994 the then designer was Pedro Vasconcelos this is a very technical course;not the longest but needing great accuracy.It has recently had a makeover by the renowned landscape architect Alvaro Mano.This involved the planting of 1000 olive trees.It is described by many as a links course.Apart from this the eighteenth hole was completely redesigned.So if you have not been there for a while;it could be worth another visit. As GOLF-COURSES go some measure of balance going out and coming in was achieved.In that on your outward journey you will encounter two 500 linear meter holes of 5 par and two 170 yard par 3's.Plenty of difficulty such as well palced bunkers and water hazards try to lure the golfer into mishaps.Come with your accurate driving "head on". Well equipped with good facilities you will find a driving range,pitching green,putting green and golf lessons available.Plus club and buggy hire and of course Restaurant and bar. 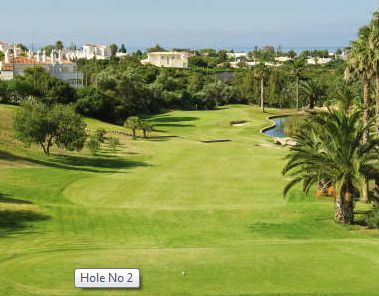 This course is a series of post card images and is very different from the majority of Golf-COURSES on the Algarve.Being mostly flat and running along the beaches;unless you are a good player you could lose plenty of balls as there is water on and around almost every hole. Course record was made in 1998 and is a very creditable 66 by one Mr Billy Sim.Do not miss this one but take plenty of dry socks! Albufeira.Balaia golf course.9 hole par 27.Course 984 meters. 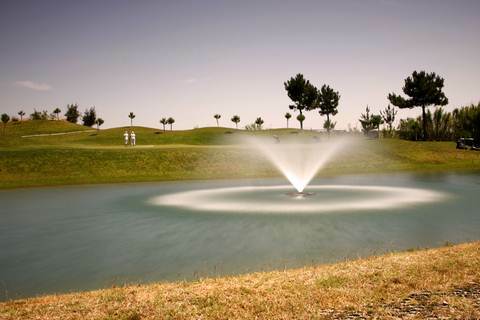 This attractive little nine hole course is part of what is optimistically known as a golf village.Mainly because it is part of and situated behind a holiday complex. The course itself has great Atlantic ocean views and it is accepted amongst players as another of those nine holer GOLF-COURSES great for learning .Great for improving ones short game and accuracy of iron play.Good place to take the family if you are learning the game or a golfer out to improve his game.Lessons here are very reasonable and come well reommended. So cleverly designed it utilises every trick in the book to make you learn to be accurate.The first hole you have to pitch downhill onto quite a small green with a strategically placed pond.Could be a good idea to have some dry socks handy.Hole no2 is picturesque due to the tree lined stream betwixt tee and green and has a nice bunker for you to land in.You need to put up the right shot if not to land in the proverbial.Third hole another deep bunker on the front edge of the green.These bunkers are designed to help your shot selection and judgement of distance.The next few holes are in the same vein. One of those GOLF-COURSES inviting you to have a go with well placed bunkers you will do well to avoid.Number six is a corker with a nice bunker to front of the green and a ball inviting stream behind.The course itself remains attractive all the way with cork trees and small pines and a lovely bridge to walk over.No let up on the difficulty though.You "gotta" stay focussed with some double bunkers .The ninth doubles you back to that pesky pond where you started.All holes are par three and always inviting you to have a go with plenty of penalties if you get it wrong. You should stay long enough to have a good few goes at this course. The Facilities here are excellent,with a driving range,chipping and putting greens.There are also tennis courts and Restaurants and bars and the clubhouse is a bit special.This is another of those fiendishly crafty 9 hole GOLF-COURSES the Algarve seems to be good at.Always with lovely views to help your mood if you have an off day. Apart from the golf course this is a well developed holiday resort with high class facilities;catering for the family orientated golfer.Vast choice of accomodation to suit everyone! All set in countryside surroundings only 10 minutes drive from Albufeira and a 10 minute stroll from the Maria Luisa beach. The unique resort has luxury traditional-style villas and low rise apartments laid out in gardens of exotic plants and shaded by mature pines and cork oak trees.All the gardens are beautifully lanscaped There are 6 unusually shaped swimming pools. The complex offers a health club with indoor heated pool, Jacuzzi and a heated indoor pool.One of the finest 9 hole GOLF-COURSES to be found anywhere. This another of the amazing nine hole GOLF-COURSES is exactly what it says on the sign board.It sits atop spectacular cliffs and amidst glorious pine woods.Not the massive pine trees of cooler climates but smaller scrub pine,which can be just as attractive in its own way.The scenery is just unbelievable as you look out across the cliff edges to the sparkling waters of the Atlantic ocean. This is another nine holer calling upon the golfer to produce great accuracy and not just because you might lose your ball over the cliffs..We have here one very famous hole known worldwide in the golfing world as the Devils' parlour.This is a par three where you have to strike over the chasm betwixt two cliffs.Obviously this is one that does not get forgotten once encountered. Pine cliffs golf course has developed its own academy offering world class facilities,which cater for not just the professionals but also the humble amateur.The academy has a Scotsman as its director under whom the course has flourished and there is great emphasis on state of the art training that includes a practise area of great flexibility.There is a driving range which can be approached from many different directions and varying driving distances.The golfer can practise shots of between 50 linear meters,right up to 200 linear meters with nine different flag positions. With its facilities for pitching,chipping and putting practise the golfer can really work on every aspect of his game and can mix it up to more replicate the different shots he would face on a proper round on GOLF-COURSES he will encounter.Thus helping to develop quicker thinking and shot selection. Of course you will find the inevitable golf shop well stocked both for purchasing and hiring golfing equipment.Then there is a superb club house with a large terrace to supply one with snacks and drinks after tackling all those cliffs and inhaling the wonderfull Atlantic air.Yet another of the Algarves stunning nine hole GOLF-COURSES designed to perfect your game. 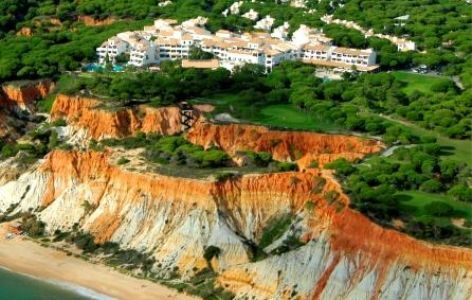 Showing the cliffs where the golf course is situated and the large pine cliffs resort,which includes a five star hotel and luxury villas and apartments.Everything is to a very high standard and caters for families.Not all GOLF-COURSES do you know! This is a real beauty amongst GOLF-COURSES and is part of a group of GOLF-COURSES known as the Oceanica group.It is just 20 minutes drive from Faro airport in the middle of Vilamoura.It was designed by Mr Frank Pennink in what has been described as a "Parkland style".It is apparently one of the oldest courses in the Algarve and has a great reputation throughout the "world of golf". The landscape is gently rolling green and pleasant quite densely covered in quite large Pine trees.These are the natural hazards of the golf course,providing heavy cover for the golfer to fret over. Originally opened as far back as 1969 it is affectionately been given the name of "The Grande Dame" in golfing circles.Being of such stately age the "Old Course" had a complete makeover in 1996 which very carefully preserved the natural beauty of the landscape, which is just as it should be done.The natural environmental habits of all GOLF-COURSES should be protected and preserved in all cases of updating them. It was deemed necessary to improve the quality of this Oceanico Course , a splendid new clubhouse and a putting green were also built at that time.The Oceanica group pride themselves on obeying environmental integrity on all their courses. Facilities include all that would be expected of such a quality course.An attractive clubhouse which was rebuilt in 1996,a well equipped golf shop and the inevitable driving range and putting green.There is a valet service and of course no golf establishment would be complete without a bar and restaurant. It is a wonder golfers ever bother going home really! The first three holes are quite average par 4 and five and should not cause many problems to competent players.From here on it does get a little more challenging with the 4th hole being a very testing par 3. It gets trickier and the player needs to think more about club selection as accuracy becomes the major requirement,if one has desires on holding par. .The trees along with plenty of bunkers on many holes do make for good judgement and intuitive correct shot selection.There are 5 par 5 holes,with the sixteenth being the long one at 520 linear meters.Then you have 10 par 4 and 3 par 3 holes.There are quite a few dog legs to contend with. This can be a real "Mother" as in challenging of GOLF-COURSES with a number of holes being capable of reducing golfers to "quivering wrecks"!. This is all together an easier course than the last.It will never be running for "one of the best" or "most difficult" of GOLF-COURSES.However it does provide a reasonable test and is definitely one for the not quite so advanced players to consider. Set amongst pine trees as so many of the Algarve GOLF-COURSESThe main designer behind this course is English golf course architects Martin Hawtree and sons. Now owned by the prestigious Oceanica group it is believed this was originally a not to good 9 hole course which the architects were commissioned to upgrade and turn into a full 18 hole course.I understand that the course was re-opened in 2000,which would fit with its name,Millenium.The clue is always there! The redesigned course wanders through the pine trees in parts and other parts are in wide open landscape with newly added plantings.Ornamental lakes have been added to further enhance the aspects of the course.The old water trick,eh!Works all the time! It seems to be the aim of the Oceanica group to make Vilamoura the main European golf destination.Spanish golf officianado's might disagree but we are firmly with the Portuguese....Yes? Of course the facilities are excellent with a superb Clubhouse;the usual well stocked Golf Shop and a "buggybar".Then the essential;restaurant and "watering hole". 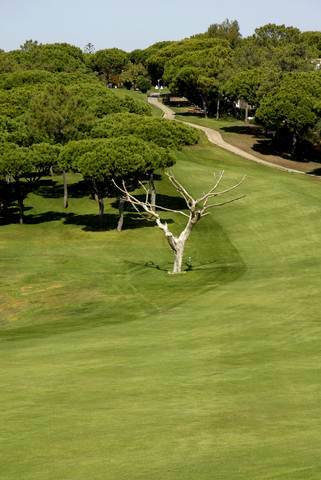 One of the most open of the Algarves GOLF-COURSES in places but parts are quite heavily wooded and the trees are quite mature.Probably they were here when the original 9 hole course was built.The fairways are much narrower where they go through the wooded areas. An 18,par 72.Over 6560 linear meters. Another one belonging to the prestigious Oceancica Group.This golf course is a bit special,attracting top tournaments and the best international players.It is a fabulous example setting out to be usefull to all levels of players with five tee positions on each hole and with wonderfull scenery.What makes it extra special? Arnold Palmer the all time great and one of golfs favourite sons designed it fairly recently.A course cannot have better credentials than that. As with all of the best GOLF-COURSES on the Algarve the utmost care has been given to retaining the environmental integrity of the area with indigenous trees and plantings.Lots of water features heavily around the stunning course;not just hazards but for irrigation purpose as well.Lakes and pools definitely feature heavily on the list of things to make a golf course attractive.Some claim it is not natural but I say as long as it is done right and allowed to be natural, so it is frequented by indigenous pond creatures and plants;then no harm is being done. Many of golfs elite rate this this most spectacular of GOLF-COURSES as an "Arnold" masterpiece with some very difficult holes.It is not just the difficulty but the engineering ingenuity which often has the golfer scratching his head.The lenghth of a number of holes can be very decieving because of the clever use of the natural contours of the landscape;causing many golfers to select the wrong club and end up in some of the most develish traps. No wonder the great man was such a supreme golfer to see and to play this course will give you some idea as to the AMAZING mind this great man has. The great "Arnold Palmer designed this amazing course on one of the flattest landscapes of any GOLF-COURSES in Portugal.To make some of the most testing holes known in the golf world on such even ground is testimony to his prowess in anything "GOLF". Facilities include an attractive and luxurious Clubhouse,well stocked golf shop for buying or hiring.The inevitable bar and restaurant,without which no healthy golf cub can function properly.Practise driving range of course!Plus practise putting green and what they term a buggy bar and finally a top notch valet service. The course has 10 par 4 holes and 4 each holes of 3 and 5 pars.The second hole par 4 is dangerous and deceptive.Be warned!The 529 linear meter par 5 fifth is said to be the most difficult par 5 and watch out for the sixth which is a par 3 and good golfing is required, to hold par. The eigth is a danger from start to finish and again can be very decieving.Number 9, is often muttered under the breath as a piece of "palmer ingenuity" or words,to that effect!The eleventh is a dogleg with a lake running along its full length and the green demands great care and accuracy.17 is "Arnold's masterpiece" and a beauty with waterfalls and a small green surrounded by water.Key advice for this most imaginative of GOLF-COURSES......pack dry socks unless you are in "Arnie's" league! An 18 hole,par72.Over 6300 linear meters. Yet another course owned by the prestigious Oceanico group.They really are out to make vilamoura the golf capital of Europe and why not,with all Vilamoura has to offer.Like superb Marina and top class shops,stunning beaches,closeness to Faro airport.The best weather in Europe and stunning countryside,immediately surrounding the town.Then a plethora of top class hotels to rival anywhere and plenty of superb high class rental properties.It really does have everything and we have not mentioned the coastal light and the wonderfull beneficial air. So that is Pinhal golf courses superior location!What about its comparison to other Algarve GOLF-COURSES. As with the other Oceanico golf courses in Vilamoura area it benefits from the natural pine tree forest of the area.This one does not run too close to the beaches.Some may not be so keen on the opening nine holes wandering through residential villas;others will not mind at all.These holes have plenty of difficulty and character to make one forget the villas lining the fairways.Plenty of thought has to go into club selection and position because of carefully positioned bunkers.Some of these first nine are exceptionally difficult and the fourth hole in particular is known to be hard to hold its par of 4 certainly if you do not avoid the devilishly ball inviting water hazard. First opened in 1976,the original designer was Frank Pennink a British architect. It underwent a partial reconstruction in 1985, by an American Robert Trent Jones Whose work has given Pinhal a unique feel with the collision of two foreign attitudes to golf course architecture.This leading to the need for varied thinking and play from the golfer; who has to contend with very small greens apart from bunkers, water hazards and trees!The whole principle here seems to have been to make this one of the trickier GOLF-COURSES in the Central Algarve region. Not just the course underwent an update;that other bastion of any successful golf club the clubhouse had a complete rebuild making it more in line with the Oceanico ethos of class and luxury.It now has fantastic views over the impressive driving range. View of the Oceanico Pinhll golf course showing the residential villas.The mature pine woods do provide some screening between the two.I suppose it is nice if you can rent one if you intend playing a lot on the one course. This is another of Oceanico's scenic and enjoyable GOLF-COURSES, if you like a challenge and like to put plenty of thought into shot selection.With numerous blind shots to be faced some intuitive play is required if one wants any chance of holding anywhere near par over the eighteen holes. There are 10 par 4 holes and 4 each of three and five par.The demands for thoughtfull shot selection start straight away with an unusual par 5 to start one off.It is a long five with a very tricky approach to the green.The pressure stays on with a very tough par 4 to follow.Three has a slight dogleg and wants you to attack the par5 but beware,only correct and accurate play will be awarded here.Number 4 one comes to the first water hazard of the round,very cleverly and wickedly placed bunkers;keeps piling on the pressure.% is an inviting par 3 but with a lake and 3 enticing bunkers guard the green.Lots of 'bottle' and accuracy wanted.6 and 7 are both par 4 and have well placed bunkers and need lots of good shot selection.8 is famous and one of the most photographed of any GOLF-COURSES holes.Plus one has to play over a pond and then you come upon a two tiered green with a few evil looking bunkers.Number 9 is perhaps the first slight let up on the mind games but still has plenty of bunkers to stay out of.10 is back to the norm with good shot selection and extreme accuracy needed,because of the very narrow entrance to the green and horribly placed trees etc.11 is another dogleg and is notable for its awkward stepped green.Good positional play required if you want to get well placed on the green.12 is a par 3 with bunkers and mounds protecting the green,you cannot afford a wayward shot here.13 is a worrying uphill most of the way par 5 with the first shots having to be played blind. !4 is back to a tricky par 3 with a well placed tree out to cause you bother along with threatening bunkers.15 is another par 4 with a nicely placed stream to make you think hard about what you gonna' do!16 has lots of well placed bunkers to contend with on the fairway and guarding the green.17 is an unusual right angle dogleg par 5 and 18 is a very tricky par 4 capable of completely ruining your day with its dangerous downhill approach and 3 deep dark bunkers to avoid. If you like your GOLF-COURSES challenging and edgy this Pinhal course is one for you to consider. Vilamoura.Laguna golf course.An 18 hole,par 72.Over 6135 lineaqr meters. So another Of Vilamoura's splendid GOLF-COURSES and guess what!Yes.....that is right it is another of the Oceanico groups GOLF-COURSES.There must be some big 'bucks' there. Designed by golf course architect Joseph lee;this one is very different from Oceanico's other GOLF-COURSES.This one has very few trees as it is set on sea level coastal landscape.So you will not be surprised to hear that it has a great many water hazards. There has been a golf course here for a very long time but it underwent a considerable overhaul by the American architect Joseph Lee.It was re-opened in 1990 and has undergone many chages and updates over the years.Water as said before plays a massive part in the character and play of one of the wettest GOLF-COURSES on the Algarve.There are two very large lakes which are used to great effect,so golfers will not miss the lack of trees getting in their way. Being close to the sea and being more exposed golfers often have to contend with very windy conditions,which along with the lakes and a huge number of bunkers (79 in all! )can make for one of the most hazardous GOLF-COURSES on the entire Algarve and that is saying something! The Oceanico Laguna course shares a large, clubhouse with its close neighbour Oceanico Millennium golf course.You will find the Millenium course not far up this page;if you have not already found it.The widness of this landscape is complimented by surrounding natural parks which draw in many wildlife tourists.Altogether everything adds up to a very wonderful playing experience for golfers of all standards. The whole course occupies a lovely valley which has been kept as natural as possible and every effort is made by a large team of professional staff to make this an exceptional and unforgettable experience for the golfer! So high are the standards in every respect that Vila Sol Golf was awarded the Green Flag for its high environmental standards by the Green Globe Order in 1996.It went on to be awarded the best Golf development award in 2001.High praise indeed considering the quality of the opposition. If that is not impressive enough there is also the famous Vila Sol Beach club on one of the Algarves most beautifull beaches;with a range of leisure activities. As Golf-COURSES go this one is definitely upmarket and a feast of luxury. As on so many of the other Algarve GOLF-COURSES Vila Sol has the wonderfull pine forests running through its valley setting and lakes to give it the "at one with nature feel".There are some truly great and very testing holes and others better for the not so experienced golfer.This place just oozes class and if at all possible one should put it on their list of GOLF-COURSES "to visit soon." Vale do Lobo Ocean golf course.An 18 hole,par 72.Over 5495 linear meters. Vale do lobo is known through out the Algarve as representing prestige and quality.Even for those who have never even been there it is just this aura that somehow goes with the name. Vale Do Lobo consists of two excellent GOLF-COURSES and a beach resort.The golf courses have hosted the Portuguese open on two occasions,so you can guess what standard is involved here.With regular tournaments being held member golfers and visitors can be involved in a very hectic schedule.Those that can afford it; that is. So the first course is the Ocean course runs through the inevitable pine tree woods we have seen in GOLF-COURSES all along the Algarve but there is a good spread of large leaved fig trees and eucalyptus trees along the fairways as well.Then we see why its name was chosen as the course runs gently down to the Atlantic ocean,all in all making for a spectacular and mentally satisfying golfing experience. The second course runs through more rolling countryside again through the pine trees and with a number of scenic lakes.The difference is that this one runs along a very dramatic cliff edge,with great views of the Atlantic and the added attraction of lots of wildflowers at certain times of year.I wonder which one would be your favourite a difficult decision to make,I can tell you. <Vale do Lobo.Royal golf course.An 18 hole ,par 72.Over 6175 linear meters. The Royal being second of the two GOLF-COURSES runs through more rolling countryside again through the pine trees and with a number of scenic lakes.The difference is that this one runs along a very dramatic cliff edge,with great views of the Atlantic and the added attraction of lots of wildflowers at certain times of year.I wonder which one would be your favourite a difficult decision to make,I can tell you.Originally designed by the late great Sir Henry Cotton.Both courses were re-developed by the American Golf Architect, Rocky Roquemore. These two lovely courses the Royal and the Ocean test the golfer's game in a way few courses are able to! Quinta do Lago.Quinta do Lago South.An 18 hole,par 72.Over 6488 linear meters. Vale do Lobo.Pinheiros Altos golf course.An 18 hole,par 71.Over 6050 linear meters. Vale do Lobo.Sao Lourenco or San lorenzo golf course.An 18 hole par 72.Over 6238 linear meters. Tavira.Quinta da Ria golf course.An 18 hole,par 72.Over 6015 linear meters. Vila Real de Santo Antonio.Castro Marim golf course.An 18 hole,par 71.Over 5625 linear meters. Castro Marim.Quinta do Vale golf course.An 18 hole,par 72.Over.6510 linear meters. More GOLF-COURSES TO COME.Plus we will be adding photos of courses and any extra information we can get on each course.So please keep coming back to see how we are getting on or subscribe to the blog on top left of any page. The South Golf Course was opened in 1974 and the designing architect was Mr William Mitchell.The South course is situated 3 minutes away from the Quinta Do Lago Hotel.Of course you do not have to stay in the hotel there are plenty of villas and apartments around for you to rent. Those who know the South course say its set-up benefits the long hitters in the game, but requires skill and great control to score well. Both the front and back nine holes are both anti-clockwise loop.it provides an enjoyable experience for the better, more experienced golfers. Being such a prestigious establishment, as you might expect,they have a strict dress code: Dress code allowed: tailored shorts with belt straps, socks, polo shirts, shoes with soft spikes. ALGARVE GOLF-COURSES is an ongoing labour of love.Lots of research has gone into this.I am too badly disabled to play golf myself but was avid about all sports all my life and indeed worked on a golf course in my younger years.During the week it used to be so quiet I had so much time to pratise mainly on the first hole;that I was able to drop the ball right by the flag nine times out of ten.So hopefully I am giving you all the information you need.If not I would be delighted if you went to the contact us button and tell me what information on GOLF-COURSES YOU WOULD LIKE TO SEE!